Itching to see the world but don’t have the savings to do it? These student-friendly money tips will get you on your way to that dream trip, gap year or big break. Finding ‘extra’ cash for travelling is a tough ask at the best of times, and can be especially challenging when you’re a student. Once you get organised, however, you can nibble your way to a savings fund without feeling overwhelmed. Read on for our 8 top tips on how to save money for travel as a student. Whether it’s a city break in the South of France or an open-ended shuffle around South America, your first step is deciding what kind of holiday you’re after. Next, you need to estimate the costs: research travel fares, food, accommodation, sightseeing … the whole shebang. Doing this step first gives you a clear goal, and will help you stay motivated while scraping together the cash. Anything you can shave off the price will make it easier to save up, so look for ways to pay less for your holiday or stretch your money further. If you’re a student, an ISIC card (international discount card) can save money while travelling. Not a student? Try the International Youth Travel Card instead. Divide your total trip cost by the number of months until you go away. This tells you how much you need to save or earn to be able to afford your holiday. You can adjust the figures – i.e. save less each month over a longer period – if you need to. Assuming you don’t have an ATM tucked down the back of the sofa, there are two prime ways of scraping together the cash every month: cut back, or earn more. We’ll get into both of them below! Start by writing down the details every time you spend money. Coffee on the go? Outrageous gas bill? Fined for going too deep into your overdraft? Get it all down and review your spending at the end of the week. Then – and this is the crucial bit! – change what you do. Turn down the heating, get organised about repayments, make coffee at home. Look for spending you can do without – and then ditch it. If your bank’s app has an auto-saving, round-up or save-the-change feature, turn it on. Every time you spend money on your debit card, they’ll round-up the amount to the nearest pound and slide the leftover into a savings pot for you – zero effort! Some third-party apps connect to your bank account to do the same thing – one called Cleo even works through Facebook Messenger. You probably do this already – for instance, choosing supermarket value brands instead of the premium products advertised on TV. Well, if you’ve got big-money travel plans, find ways to downgrade everything. Switch bill suppliers to pay less, consider walking to save on bus fares – you could even commit to only buying pre-loved or reconditioned stuff and see how much you save. The biggest gains are to be had from switching-up accommodation. Moving to a cheaper property, living at home, or negotiating your current rent can all save masses over a year, though you’ll need to plan well ahead to make it work. Clutter can be a goldmine – we’re talking clothes, old phones, the roller skates you’re using as a door stop… The golden rule is, if you haven’t touched it in 6 months, get rid: list it on eBay or advertise locally via noticeboards or a bootsale app. Next, look for other people’s clutter to sell, via freecycling websites as well as store samples and online giveaways. A step up from selling your possessions is selling your skills – and everyone has something to offer. If you can play an instrument, build a website, speak another language or explain your subject to a 5-year-old, you can cash in on it. Freelance marketplaces like Fiverr or Freelancer can connect you with clients, but if you’re prepared to get out there and drum up business you can go it alone. Even better, remote jobs or tutoring can be done anywhere via email or video calling – that’s bonus cash if you need it while travelling. Focusing on a monthly goal rather than a Titanic-sinking total sum helps stay motivated while saving. Then find just one or two things to do every day that move you towards your goal: say no to an impulse buy, take on an extra shift at work, spend an hour finding a cheaper phone contract. Like most things in life, saving for your travels is much easier if you take it in small, easy steps! This was a guest blog by Ruth Bushi, an editor at Save the Student – the UK’s largest student money advice site. 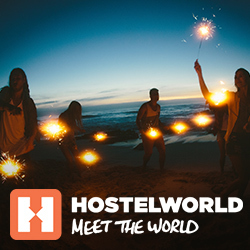 The post 8 steps to saving money for your dream trip as a broke student appeared first on Hostelworld Blog.